Our view out the window climbing out of Mendoza towards Chile. 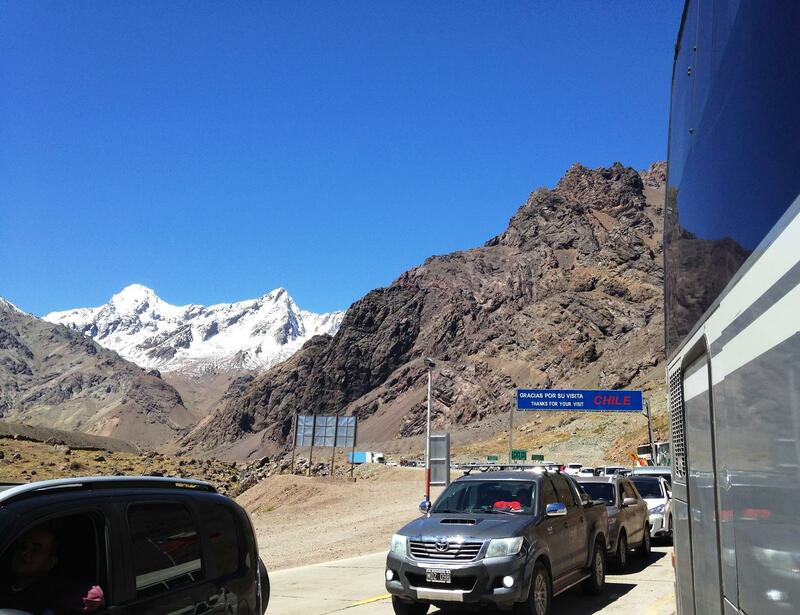 Crossing The Andes via omnibus may not have been as romantic or exciting as trekking or on horseback, but it was definitely convenient and incredibly cost effective. 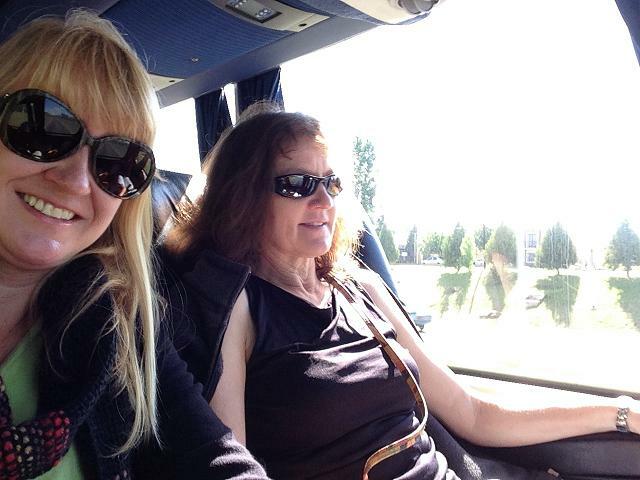 The busses and the bus network in Argentina are efficient, frequent and quite nice, so we sat back and left the driving to Andesmar. 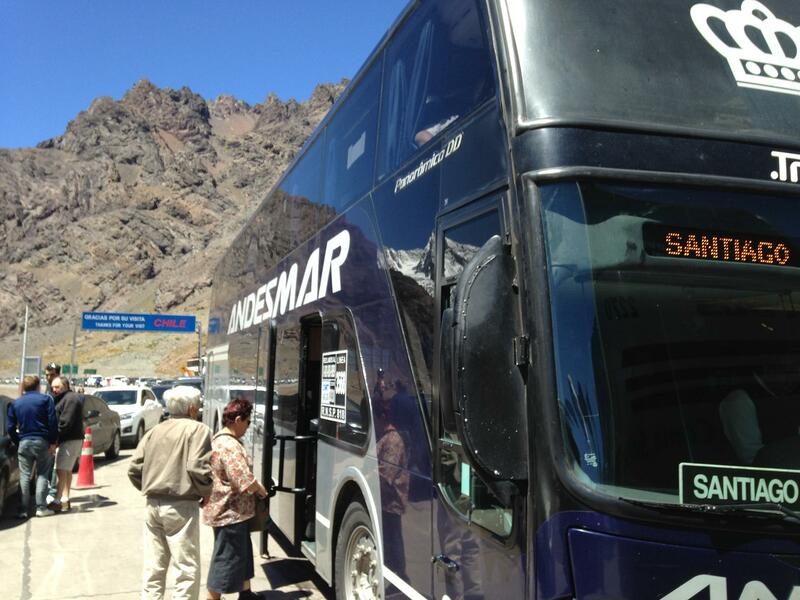 The bus we took from Mendoza to Santiago was a double decker. 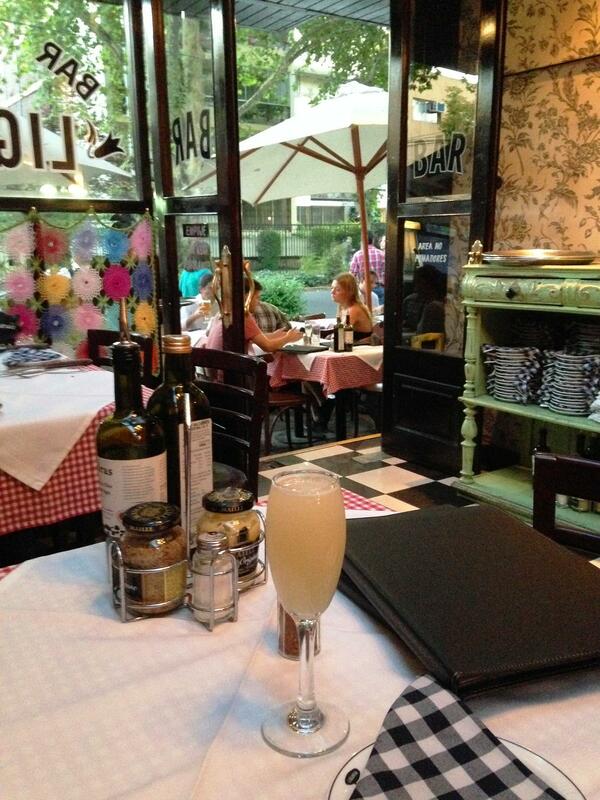 We left Mendoza at 10:30 am, settling ourselves into the large and comfortable seats in the front row of the top level. The seats afforded us a good view and more legroom than on an airplane except possibly first class. 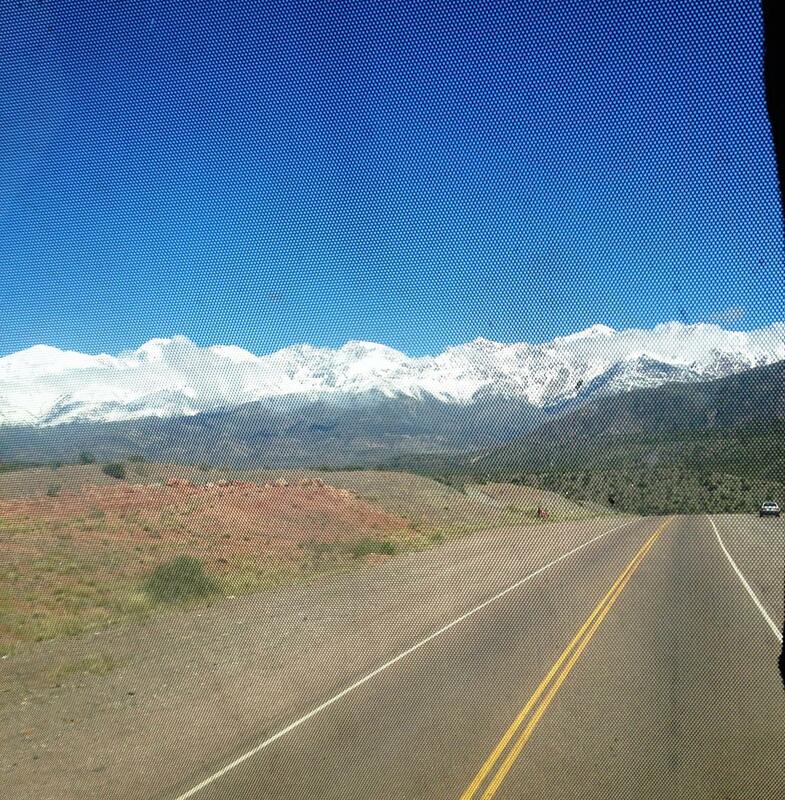 We climbed through the Argentinia side of The Andes with a beautiful view of the snow capped peaks. 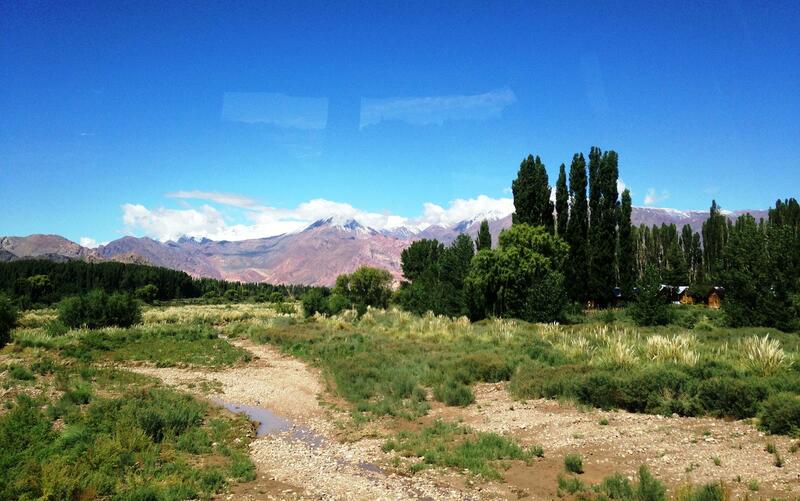 The bus made few stops and passed through one very small town. At noon someone came through and handed out sandwiches and sodas. The 8 hour trip with a border crossing cost us each $40. Taken through the front windscreen from the top level. 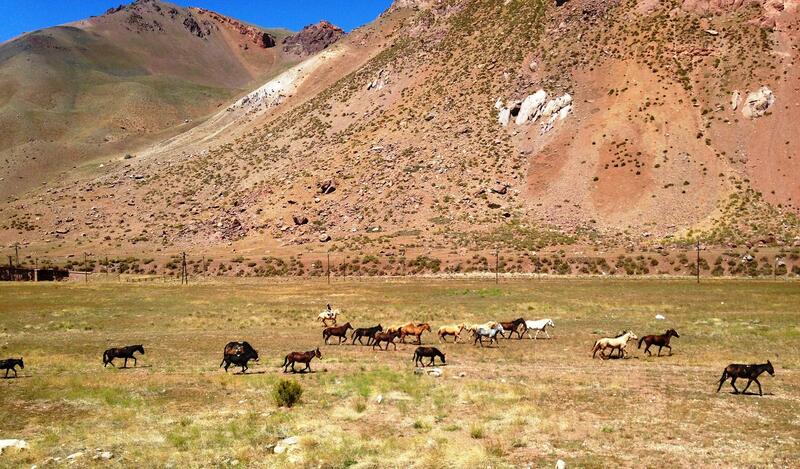 Near the top of the pass, out the side window of the bus we saw a gaucho herding horse and mules. 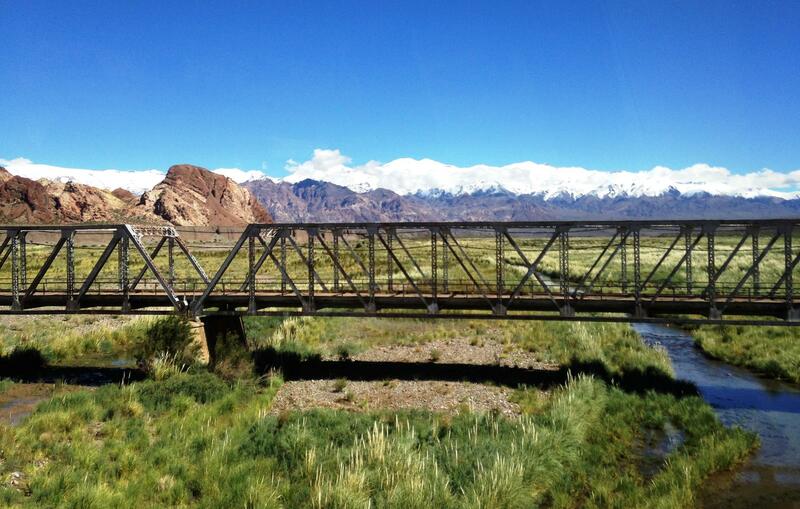 It made me stop and think, as romantic as the idea of crossing The Andes on horseback sounded, I was glad we did the trip in a total of 8 hours, and not 8 days. 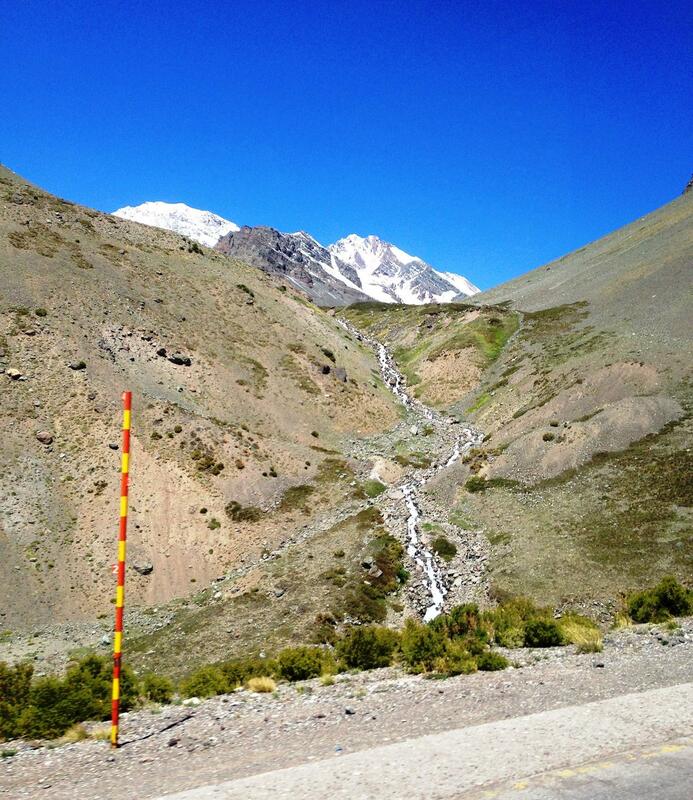 After only one long tunnel (thankfully), and still below the snowline, the border was at the top of the pass. Customs and immigration took about two hours with a search of the luggage where I lost my little bag of Chia seeds given to me by the cook at El Bordo. Too bad. On the Chilean side the two lane road was under construction and down to one lane. We had to wait for another 30 minutes for our turn to start down. (We were told that two days prior to our crossing the road had been closed to all traffic due to a rockslide). 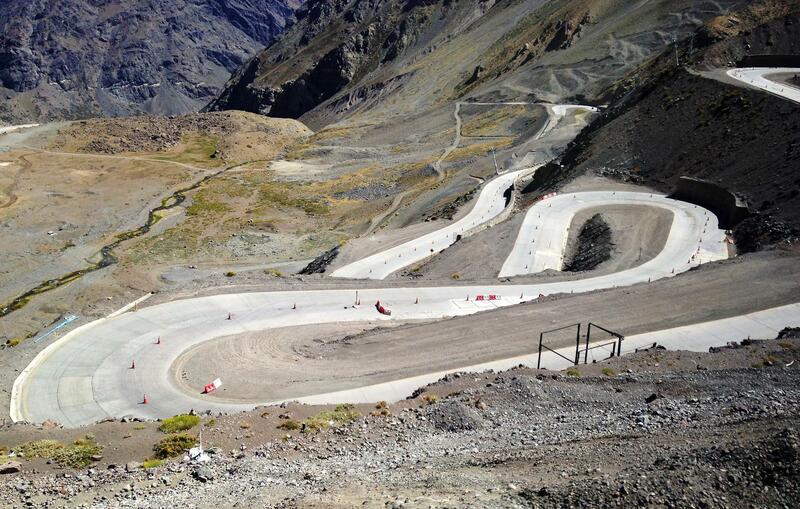 The descent into Chile started with about 24 hairpin turns, then the gradient shallowed and the terrain became farmland. 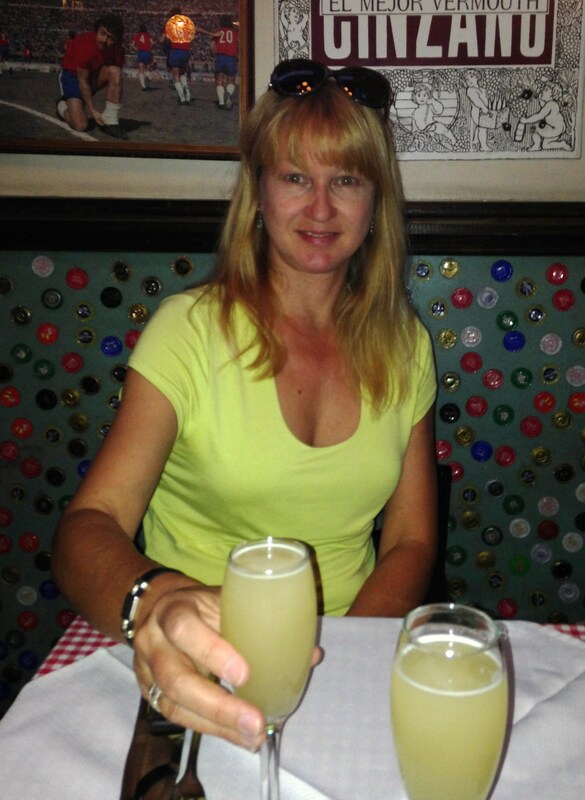 The ride was scenic and it was wonderful not to worry about signs, directions or the driving. We hit rush hour traffic coming into Santiago, and the bus station was a mad house. 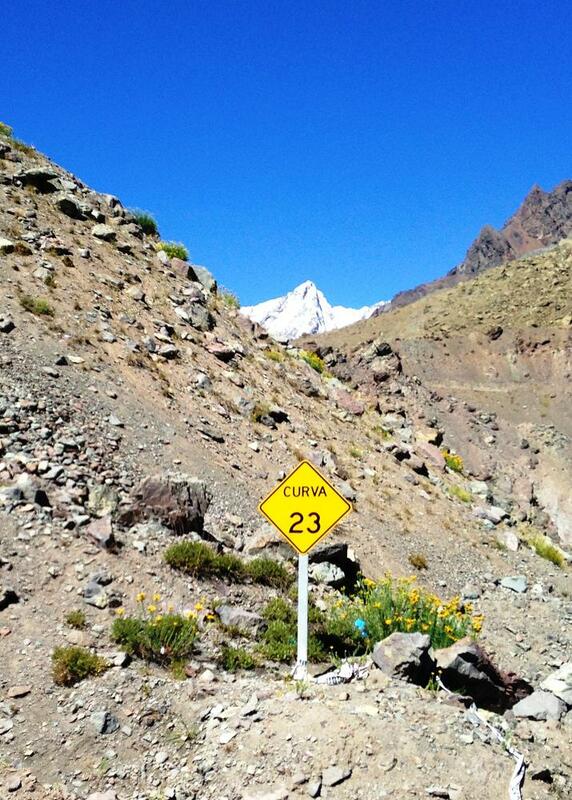 Somewhere near the top of the pass descending into Chile, we passed this sign indicating turn 23. 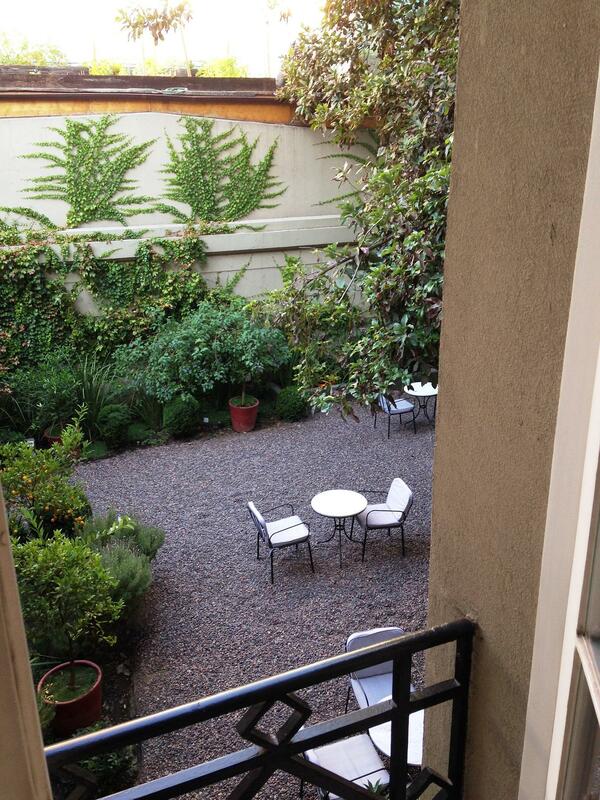 The view from our room at Le Reve into their private backyard seating area.